Out of need, Higher Ed customers have developed their own customized approach to manage constituent’s data in salesforce. While many institutions have done it successfully and have given a thoughtful structure to the solution, however others have struggled to build a structure that would scale and cater to various enterprise use cases. The wide range of customized data architecture that existed in the HED market had created lot of confusion and frustration as customers seek to grow beyond their initial implementation and one solution did not cater to all the use cases. That’s wherein HEDA was launched for Higher Ed to address some of the most common use cases and provide the necessary framework and essential data structure to foster institutional growth, innovation, and success with the Salesforce1 platform. HEDA does not solve every problem but rather encourages and anticipates end user configuration to be built on top of the HEDA framework. One of most common business requirement in Higher Ed is handling constituent’s relationship and affiliations, leverage it for growth and innovation. HEDA is entirely focussed on representing relationships throughout a student’s lifecycle. Here in this blog we will see how HEDA can be used to handle various use cases related to Affiliations and Relationships. 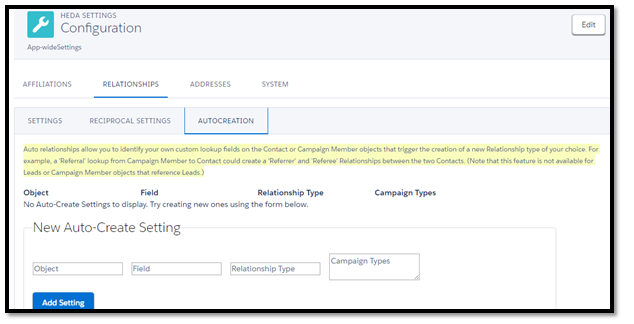 Use Case 1 – Defining multiple Affiliations for a Contact and their associated Affiliation Type. Affiliations (hed__Affiliation__c) object is used to manage various Affiliations between an Account and Contact. For each Affiliation, an Affiliation record should be created between the related Account and Contact. Affiliation Type is managed through Record Types on Affiliation object and is expected to be same as the Account Record Types. Any Account can have a Primary Contact and it is driven thru the Affiliation object. While creating an Affiliation record, the contact can be set as the Primary Contact for the Affiliation Type. However, a contact cannot be a Primary Contact for two Accounts with the same Affiliation Type. It replaces the Primary relationship with the former Account. 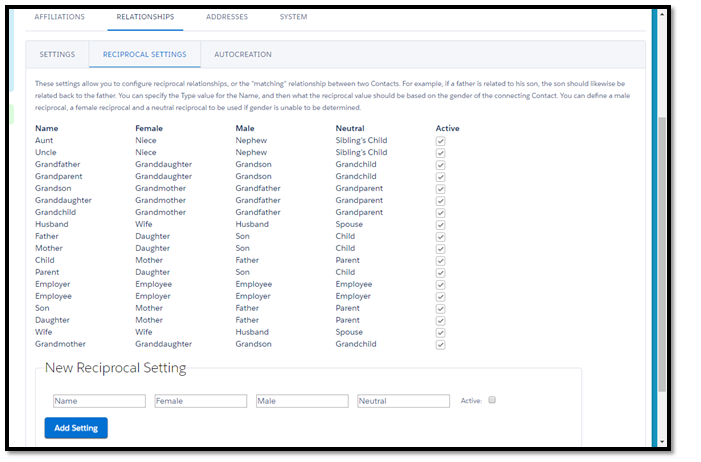 The mapping of Affiliation fields and Account Record Type (Affiliation Type) is mainted in ‘Affl Mappings’ Custom Settings. New Affiliation Mappings can be edited or added thru the HEDA settings custom tab (image below) on the HEDA app or directly thru the Setup menu. If a primary Affiliation of certain type exists, and another one of the same type is created, the first one would be made non-primary. Type picklist field determines the Relationship Type. Values can be edited or deleted as per customer’s requirement. Good Set of values already comes by default. HEDA will create an environment for developers to build in agreement with HEDA specifications, giving Salesforce.org customers confidence when engaging with the salesforce partner ecosystem and providing partners and schools confidence that they are aligned with a Salesforce.org supported framework.